KIEV, Ukraine—President Viktor Yanukovych brushed off Moscow's latest efforts to woo Ukraine into a Russia-led trade bloc, insisting in an interview that Kiev wants special terms that would allow it to develop relations with the European Union as well. Ukraine's President Viktor Yanukovych shook hands with Russia's Prime Minister Vladimir Putin during Mr. Putin's visit to Kiev earlier this month. In recent weeks, Moscow has stepped up pressure on Ukraine to join its Customs Union, which already includes former Soviet republics Belarus and Kazakhstan. Russian Prime Minister Vladimir Putin said on a visit to Kiev on April 12 that membership would bring benefits of up to $9 billion a year for Ukraine. Other officials suggested Ukraine could save $8 billion a year on its gas bill to Russia if it joined the Customs Union. In the interview, Mr. Yanukovych dismissed such offers as "political statements," and said that "Ukraine hasn't received any concrete proposals." He all but ruled out full membership of the Customs Union, which would preclude the EU free-trade deal Ukraine is currently negotiating. Instead, he suggested Ukraine would seek a free-trade agreement and other cooperation with the post-Soviet bloc in what he called a "3+1" format. Ukrainian Foreign Minister Kostyantyn Hryshchenko told Parliament on Friday that this meant cooperation "outside the framework of formal membership." Mr. Yanukovych declined to speak in detail about the shape these relations would take, saying that would be "crystal ball-gazing" because negotiations have yet to start. Some observers say Kiev's tough line could be at least partly a negotiating tactic. Russian President Dmitry Medvedev will visit Ukraine on Tuesday to commemorate the 25th anniversary of the Chernobyl nuclear accident, and he is expected to discuss the Customs Union with Mr. Yanukovych. Mr. Yanukovych's choice is seen as a bellwether for Kiev's geopolitical direction. The EU agreement would be a major step toward deeper economic, political and cultural integration and offers Ukraine access to a larger, wealthier market. A deal with the Customs Union would tie Ukraine more closely to its former Soviet neighbors, but could bring short-term benefits to the country's struggling economy and its powerful industrial tycoons. Russia seemed to be tightening its grip on Ukraine after Mr. Yanukovych agreed in April 2010 to a controversial deal that extended the leasing of a Ukrainian port to Russia's Black Sea Fleet until 2042 in return for a big discount on natural gas. He also pledged to end his predecessor's pursuit of membership of the North Atlantic Treaty Organization, which had irked Moscow. But Mr. Yanukovych balked at Russian proposals for even closer cooperation, such as merging Russian state energy giant OAO Gazprom with its Ukrainian counterpart Naftogaz. Mr. Yanukovych, brought up in Ukraine's Russian-speaking east, was long seen as favoring Moscow. He received Russian backing in his 2004 bid for the presidency, but was thwarted by the Orange Revolution, which propelled pro-Western Viktor Yushchenko into office. Since coming to power, however, Mr. Yanukovych has balanced the revival of relations with Russia by stepping up negotiations with Europe on a free-trade agreement. 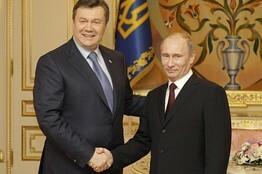 Talks with the EU have come a long way, Mr. Yanukovych said, and a number of differences had been overcome. "We haven't agreed yet on some of the questions, and that process is continuing," he said.The Ukrainian government has said it wants to iron out remaining differences with the 27-nation bloc by the end of the year. Mr. Yanukovych said Ukraine had proposed seeking compromises with individual countries over their demands, which could then be adjusted in the EU's negotiating mandate. Opposition leader and former Prime Minister Yulia Tymoshenko criticized Mr. Yanukovych for not coming out more clearly in favor of an agreement with Europe. "He's treading water while the country is stagnating," she told reporters Friday. Ms. Tymoshenko and around a dozen members of her former government are under investigation in criminal probes that have been criticized by U.S. and EU officials as politically tinged. Mr. Yanukovych brushed off the concerns. "There's no politics here," he said, adding that the investigations were part of an anticorruption drive and that a court would decide whether those being investigated were guilty or not. Тимошенко: Back in the U.S.S.R? Вперед к Европе!